Moving can be a daunting and stressful process. Between trying to sell your home, finding a new one, packing boxes, and finding a moving company, there’s a lot that goes into relocating. Moreover, it’s also a very expensive event when it’s all said and done. Every aspect of moving gives you quite a bit to think through. This is why the time and date that you move is often not a priority on your list. However, the time of year that you move can have a large impact on your budget. It can also affect many other things, like the ease with which you move as well. Before picking a random time and day to pack your stuff into a truck, consider these reasons why spring and summer are the best times to move. One of the hardest parts about moving is selling your current property and finding a new one to move in to. In most cases, you rarely receive what you hope to for your home and attempting to find a house you love within your price range is often easier said than done. Thankfully, there are periods of the year that are better for selling and buying homes than others. The summer is a prime time to enter the real estate market. It tends to be the moment houses really start to sell and come onto the market. You’ll find that by moving during the summer, you’ll get a better deal and more money for your home. Moreover, you’re also more prone to find a home that is the best investment to you for your money. A big part of moving is going through all the things you’ve accumulated over the years. By doing so, you’ll find an array of items you no longer need or want. However, instead of simply tossing everything or taking it to the Goodwill, you might as well make some extra money off of some of your unneeded treasures. A great way to do so is by holding a garage or yard sale. Of course, since weather has a large factor on the outcome of this, summer and spring are often the best times to put one on. By choosing to move and host a garage sale in the warmer months, you’ll get a much better turn out of shoppers, make more money, and get rid of more things. No matter where you move to or from, you’ll no doubt spend a good portion of your moving time outdoors. After all, you have to get all your things onto a truck somehow. That being said, it’s really no fun to move when the weather is bitterly cold, rainy, or potentially snowy. Moving during the extremely cold months could make physical labor dangerous. Plus, your transportation and travel will be that much more hazardous as well. Moving is already a stressful and unpleasant process, so why not make it as easy on yourself as possible? Of course, if you’re moving someplace with too hot of a summer climate, spring might be your best choice for moving date. The blistering summer heat also doesn’t make for ideal moving weather either. Consider where you’re moving from and to and then center your moving date around the optimum weather. If cost is a big factor in your move and you’re hoping to save as much as possible, then you’ll want to avoid the prime moving time of year as much as possible. Summer and fall tend to be the busiest times of year for moving companies. However, March through Labor Day tend to be great times to move cost-wise. Most people with kids will wait until summer. This way they don’t disrupt their kids schedules. University students usually move come the beginning of summer as well. By moving during early spring, you’ll likely have your pick of dates and save money on the company you hire. Although summer is busiest and means you might not save as much when hiring a moving company, if you have a family, summer is usually the best time for your kids. Moving is difficult and stressful to adults in itself. It always takes some time to get settled upon moving, and you’ll probably be living out of a boxes for a little while. If your kids are in school, moving during the academic year just makes it all the more stressful. You not only cause a major disruption to their routines, but ultimately cause more stress for yourself as you try to keep their routines intact among the shuffle. Moreover, if your moving to a new school district, city, or state during the summer, your kids will have the opportunity to start a new school at the beginning of the year as opposed to jumping in in the middle. Unless you’re self-employed, moving usually means taking off from work as well. Many companies tend to slow down in business and operations during the summer, especially since that’s when many families go on vacation. If you have a position that sees slower summer months, then moving in the summer is likely the ideal time to do so. You’ll probably receive time off more easily and won’t feel as though your disrupting operations as much. You won’t have as much to catch up on and your supervisor will appreciate it. Moving to a new home or place can be an exciting and new adventure. However, there are a lot of steps and stresses that come with picking up all of your things and relocating to a new home. It’s easy to forget that the date and time of year you move is just as important as finding the right moving company. 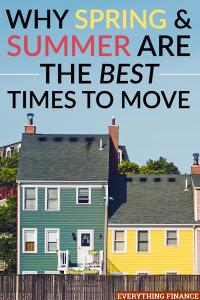 While you can choose to move at any time of the year that you chose, you’ll find that summer and spring are usually the best times to move. Have you moved recently? What is your advice for finding the best times to move?